At first sight, it was just unspectacular political routine. 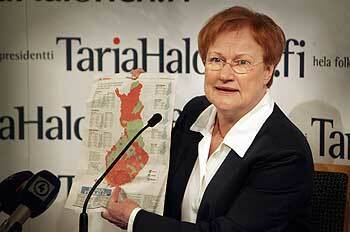 On Jan. 29, Social Democrat Tarja Halonen was re-elected president of Finland. In the second round of the elections, "Mother Tarja" beat her opponent Sauli Niinistö, who represented the conservative National Coalition Party, with 51.8 percent of the votes. Opinion polls already foretold this outcome. But a delicate subject that has frequently turned up in Finnish political debate over the last 15 years would eventually overshadow the recent electoral struggle as well: its future membership in NATO. Niinistö — finance minister from 1996 to 2003, and in daily life one of eight vice presidents of the Luxembourg-based European Investment Bank — not only made an enthusiastic plea for reducing taxes, but also for joining the trans-Atlantic alliance. In an interview with Helsingin Sanomat (Jan. 22) he stated that because a more European NATO is now evolving, one in which Europe will take more responsibility for its own security, applying for membership should be a serious option. The next round of enlargement, with Balkan countries such as Albania, Croatia and Macedonia, will make an unambiguous Finnish choice inevitable, Niinistö warned. In the same edition of Helsingin Sanomat, Halonen made it clear that there is no reason for an immediate application ("It is only an option. Nothing has taken place that would make it more urgent. "), and emphasized the need for the support of the people. The latest discussion on NATO is a result of Finland's participation in two European battle groups, and the question of how that might affect the country's traditional military non-alignment. In December 1999, during a meeting in Helsinki, the European Union made the decision to develop its own defense component. Its Rapid Deployment Force will consist of 13 detachments, each composed of 1,500 soldiers. Finland joined two units — one together with Germany and the Netherlands (it will be on duty for the first time in early 2007), the other, together with its "Nordic brethren," Sweden, Norway and Estonia (which will be active in the course of 2008). Four of Finland's five partners are members of NATO, and the NATO Response Force (N.R.F. ), which was initiated by American Secretary of Defense Donald Rumsfeld in September 2002, will be providing all training facilities. From Feb. 27 to March 17, Finland will attend a military crisis management exercise at the Transformation Command in Norfolk, Virginia, led by the United States Joint Forces Command (U.S.F.J.C.). In November of this year, the 26 political leaders of NATO will meet at a summit in Riga, the capital of Latvia, and decide whether relations with non-member states like Australia, New Zealand, South Korea, Japan, Sweden and Finland will be intensified (as NATO Secretary General Jaap de Hoop Scheffer and German Chancellor Angela Merkel, among others, have recently suggested), and whether potential partners like these will be allowed to join the N.R.F. as such. Many Finnish politicians and analysts seem to feel uncomfortable with the idea, wondering whether the official, non-committed status of Finland might become a dead letter if the country does indeed join the N.R.F. Unable to shrug off its familiar cocoon of neutrality, Finland is in the midst of an identity crisis as it looks for a new role in a world that has changed considerably since the implosion of the Soviet Empire in 1991. Unlike its neighbors to the south, the Baltic States, Finland avoided the cruel and disastrous fate of outright annexation by Stalin's Soviet Union in 1944. The price it paid was a policy of strict neutrality, which it maintained throughout the Cold War. Finnish neutrality reached its zenith in the 1960's and 70's and was embodied in President Urho K. Kekkonen (1956-81), host and chairman of the legendary 1975 Conference on Security and Co-operation in Europe, in Helsinki. After the inglorious collapse of Communism, Finland was faced with the challenge of defining its neutrality in a completely new way. The down-to-earth Finns adapted their foreign policy at a rapid pace. In 1995, Finland joined the European Union, thus relinquishing its neutrality de facto. The Finnish government announced that it would henceforth adhere to a policy of non-alignment and that it would not rule out the possibility of concluding a military alliance. Finland also had decided to bolster ties with NATO. In May 1994, it joined NATO's Partnership for Peace program and, in May 1997, the Euro-Atlantic Partnership Council. The Finnish army joined NATO-lead peacekeeping missions in Bosnia, Kosovo and Afghanistan. Despite the molding of a more active, pragmatic foreign policy, no one so far has been willing to take that one final and decisive step: abandoning the status of non-commitment and applying for NATO membership — in December 2004, the Eduskunta (parliament) again reiterated Finland's non-aligned status. At least four reasons can be adduced for this vacillation. Within the ranks of the conservative National Coalition Party, discord is slumbering, too; only a narrow majority of 51 percent supports NATO admission, as a poll indicated last year — Niinistö's enthusiasm is not entirely uncontroversial, or so it seems. The conservative-liberal Center party of Prime Minister Matti Vanhanen — the S.D.P. 's coalition-partner and the ideological heir of the late Kekkonen — is vehemently opposed, with the exception of a small minority lead by former prime minister Esko Aho. The junior partner of the ruling coalition, the S.K.P., the party of the Swedish-speaking Finns, is in favor. Second, the new Constitution, introduced in 2000, has made conducting foreign policy a rather laborious exertion. Although President Halonen is still the commander in chief of the armed forces, she heads Finland's foreign and security policy in cooperation with the government. Prior to 2000, she could have conducted foreign policy alone. Different opinions and colliding egos (Halonen, Vanhanen, Tuomioja and several defense ministers) have resulted in a stiff decision-making process. Third, Finland still shows itself susceptible to the wishes of the Kremlin. The "Agreement of Friendship, Cooperation and Mutual Assistance," which was imposed on the Finns by Stalin in April 1948 and was employed by his successors to furnish Finnish neutrality with a juridical justification, is a thing of the past now (it was cancelled in January 1992). But ever since 1991, all successive Finnish governments have sought to avoid the Kremlin's wrath. How will it react if Finland decides to make the big leap to NATO, when as a consequence the Gulf of Finland, the shipping route to St. Petersburg, will be sandwiched between two NATO countries (the other one being Estonia)? A handful of politicians like Ari Vatanen, member of the European Parliament and a former world rally champion, are calling for a more vigorous attitude towards Russia. In a remarkable article in the Wall Street Journal (Feb. 22, 2005) Vatanen wrote: "How is the petite Finnish Maid reacting when looking at Russia, where democracy is sadly going down like the Kursk, the Russian submarine that sank in August 2000? … If President Vladimir Putin in his actions is a prisoner of his past, we certainly cannot afford to be the same." However, Vatanen is an exception; the greater part of the Finnish political establishment remains silent. Estonia — Finland's small culturally and ethnically related southern neighbor — has kept a close eye on the debate over the last few years. It is hardly surprising that the Estonians would like to see Finland join NATO, the main reason being a strengthening of their own position with regard to Russia. However, only a few Estonian politicians are willing to make concrete statements. "Unlike many Finnish politicians who cannot resist the impulse to teach others, especially their poor 'cousins' in the south, how to do things, I can very well resist the temptation to patronize and be overbearing and so I shan't offer the Finns any advice," said Toomas Hendrik Ilves, member of the European Parliament and a former foreign minister and ambassador to Washington. His successor as foreign minister, Kristiina Ojuland, is a talkative exception. "There is no argument for neutrality in the current world, since security has become a common business. Finland … will join NATO one day," she said. Ojuland will have to exercise patience. Now that Halonen has been re-elected and Niinistö has caught a plane back to Luxembourg, the NATO debate in Finland will probably fall into the background. It might crop up again next year, during the campaigns for the parliamentary elections. But it is highly doubtful whether Secretary General De Hoop Scheffer can bid welcome to Finland as NATO's 27th member state on the short term. Jeroen Bult is a freelance journalist and publicist. He has written numerous articles for Dutch and Estonian newspapers, magazines and Web sites. He is also a columnist for Postimees, Estonia's biggest daily. View the Worldpress Desk’s profile for Jeroen Bult.